The local government of Quezon City met with ABS-CBN Lingkod Kapamilya Foundation, Inc. on February 20, 2017 regarding their 2.5 million peso Platinum Sponsorship for the Rocky Gathercole’s Fashion Gala Event which will be for the benefit of Bantay Bata 163. 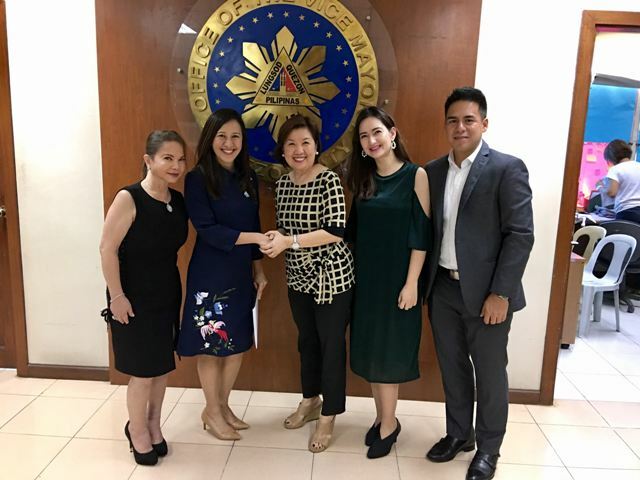 In this photo (L-R): Mila Sering, Event Chair of Rocky Gathercole Fashion Gala; Joy Belmonte, Quezon City Vice Mayor; Susan Bautista Afan, Managing Director of ABS-CBN Lingkod Kapamilya Foundation, Inc.; Kate Coseteng, Quezon City District 3 Councilor; Councilor Onyx Crisologo, Quezon City District 1. Rocky Gathercole is a Filipino Fashion Designer of Hollywood celebrities like Lady Gaga, Nicki Minaj, Ariana Grande, Katy Perry, Britney Spears, Paris Hilton, Jennifer Lopez, Carrie Underwood, as well as international beauty queens.